Simon & Schuster Books for Young Readers, 9780689858093, 32pp. Zoe Fleefenbacher has one blue eye and one green eye and bright red hair that goes on . . . forever. Her hair has always been unruly, but now she is in first grade and according to her teacher, Ms. Trisk, “first grade has rules.” It takes countless barrettes and scrunchies to finally hold Zoe’s hair. But when it can help with an uncooperative science lesson, will Ms. Trisk let Zoe’s hair free? Acclaimed author Laurie Halse Anderson and vibrant illustrator Ard Hoyt style a hair-raising story that is sure to be a ‘do! 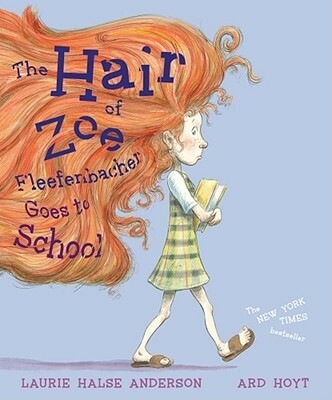 Ard Hoyt has illustrated a number of books, including the New York Times bestsellers I’m a Manatee by John Lithgow and The Hair of Zoe Fleefenbacher Goes to School by Laurie Halse Anderson. Ard lives with his wife and five daughters in Bentonville, Arkansas.